Sedum morganianum will grow anywhere. Ideally, it likes full sun, a well-drained soil and regular watering in the warmer months, but it will accept less than ideal conditions. 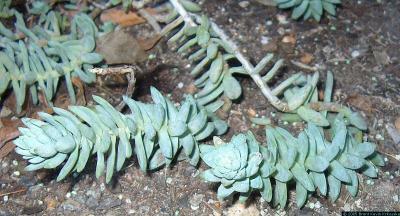 I've never lost a Sedum morganianum; in fact, they seem to grow anywhere. In full sun, Sedum morganianum starts to bloom in mid-spring to summer. The inflorescense keeps growing and putting out new flowers indefinitely. The flowers are small, fleshy, and off-yellow to orange-ish. They seem to make seeds, but since a new plant can be grown by throwing a leaf anywhere, and I mean Anywhere, I've never tried. Sedum morganianum is great for hanging baskets or foundation soil where nothing else will grow.